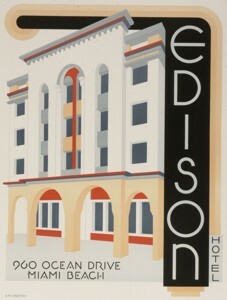 This poster entitled "Edison Hotel" was created by Woody Vondracek . It is signed on the poster plate by the artist. The poster measures 24" by 36½" and is in excellent condition. The poster was originally printed by the Edison Hotel and still sells in stores for $115 unsigned. it's is a beautiful piece of art to remember a great vacation.